After Noah's Ark came Egyptian dhows, Roman Triremes, Spanish Galleons, British men of war, clipper ships like the White Cloud, Robert Fulton's steam engine, paddle wheel riverboats, Brunel 's propeller and the venerable petrol and diesel engines. But it wasn't until the 20th century that marine propulsion hit its stride. 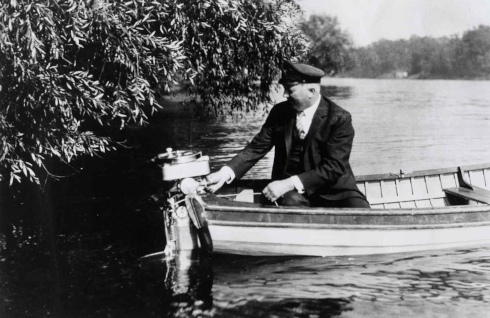 As the story goes Ole Evinrude invented the first practical outboard motor in 1909, the invention inspired by true love. Rowing a boat on a hot summer's day to bring vanilla ice cream to his beloved girlfriend, Bess, the vanilla melted before he could get back to the island. Necessity is the mother of invention. Truth be told, some antique outboard cognoscenti dispute whether the Evinrude was first, or simply one of the better publicized enterprises. A little known sidebar, at about the same time, Ole helped Harley Davidson engineer its first carburetor. In the beginning inboard propeller shaft bushings were wood, machined from the rockhard tropical Lignum Vitae tree. That is until the 1920s when a Californian mining engineer improvised a bearing using a chunk of common rubber steam hose pressed inside a sleeve. The modern day Cutless bearing replete with flutes and naval bronze tubing was born. Cutless bearing technology advanced during the WW II battle for the Coral Sea when reverberations from explosions in the water hardened the rubber in Cutless bearings. Battleship propeller shafts locked up solid. Rigid rubber was soon replaced by resilient nitrile rubber. Tetraethyl lead (TEL) was first blended with gasoline in 1924, bumping up octane, lending marine gas engines significantly more horsepower. The only problem was its toxicity which would come back to haunt the additive decades later. At about the same time boat racers burning up the waters around the world, running marinized aero plane engines, calling the hopped up Allison and Rolls Royce V-12s supermarine motors. Contrary to popular opinion, four-stroke outboards have been around for quite a long time. From 1961 to 1972 the Homelite Bearcat, rated 55 horsepower, was eminently popular. Even though its overhead camshaft design was about ten years ahead of Detroit, two-strokes would be the outboard of choice until the 90's. Because of their lighter weight and lower maintenance. For the record, Honda was selling smaller horsepower outboards in the US as early as 1972. Back in the 50's speedboat racing on the Great Lakes was bubbling redhot when Crusader introduced a marinized Cadillac V-8 inboard that went on to power a flotilla of homebuilt hydroplane race boats, classic wooden runabouts and even a sprinkling of sailboats. In 1959 Volvo Penta and James Wynn introduced Aquamatic, the first production stern drive, offering boaters a third power option, beyond outboard motors and inboards. 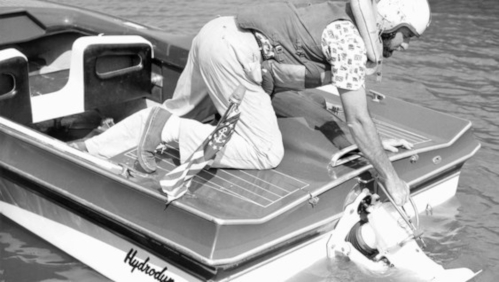 Still in the days of black and white TV, in 1962 Mercury Marine unveiled the world's first 100-hp outboard motor. Painted phantom black, the Merc 1000 polarized boaters. Some loved it, others not so much. Doomsayers wagged fingers, warning all that horsepower would surely result in death and destruction. The press intro for the Mercury 100-horse was like a circus, replete with an elephant on skis, sedated of course, and pulled behind a boat. Skiing, as it were. This was intended to show just how powerful the Merc 1000 was. In 1978, during the second oil crisis, gasohol was introduced to cut dependence on foreign oil. But the alcohol/gasoline blend brought significant problems for marine engines. It caused loss of horsepower, even worse it absorbed moisture from the atmosphere wreaking havoc with fuel filters and carburetors. The litany of maladies would be repeated decades later in 2006, deja vu all over again. In 1983 Volvo Penta introduced Duo Prop, a diesel stern drive that spins twin propellers in opposite directions on the same axis. Not long after gas engine Duo Props would appear. At about the same time Volvo began to experiment with inboard versions of Duo Prop, including one wild machination spinning triple propellers. Later, in 2003, lessons learn in the project evolved into IPS. Due to its inherent toxicity TEL was outlawed in 1986; welcome news for the environment but causing serious problems for stern drive and inboard engines. Quite opposite of the circumstances in 1924, horsepower had to be dialed back. Another complication, besides raising gasoline octane, lead also lubricated valve seats that were now wearing out prematurely. In 1985 Evinrude introduced the worlds' first 300-horsepower V-8 outboard, a two-stroke monster motor with a cowling literally big enough to accommodate, petite soirée, a table and chairs. It would be another two decades until another outboard that powerful came to market. In 1990, Indmar Marine introduced the first fuel-injected inboard marine engine. Based on a 5.7 liter Corvette engine, the 310-horsepower V-8's fuel to air mixture and ignition timing are fully computer-controlled. In the early 90s the EPA mandated a 75-percent reduction in outboard motor hydrocarbon and NOx emissions to be in place by 2006. In 1996 Mercury responds with OptiMax, a direct-injected two-stroke. Evinrude unveils Ficht, its direct injected two-stroke. Similarly, Yamaha, Suzuki, Honda, and Mercury are already busy populating their product lines with four-stroke outboards. Conventional two-strokes are dinosaurs doomed to extinction. Finally, even when measured against the time of 100 years it seems as if engineering marvels have come at a dizzying pace. It gives one pause: What the next century will bring?